Many Chinese cities, among them Ningbo, are investing heavily in AI and facial recognition technology. Uses range from border control — at Shanghai’s international airport and the border crossing with Macau — to the trivial: shaming jaywalkers. In Ningbo, cameras oversee the intersections, and use facial-recognition to shame offenders by putting their faces up on large displays for all to see, and presumably mutter “tsk-tsk”. So it shocked Dong Mingzhu, the chairwoman of China’s largest air conditioner firm, to see her own face on the wall of shame when she’d done nothing wrong. The AIs had picked up her face off of an ad on a passing bus. False positives in detecting jaywalkers are mostly harmless and maybe even amusing, for now. But the city of Shenzhen has a deal in the works with cellphone service providers to identify the offenders personally and send them a text message, and eventually a fine, directly to their cell phone. One can imagine this getting Orwellian pretty fast. Facial recognition has been explored for decades, and it is now reaching a tipping point where the impacts of the technology are starting to have real consequences for people, and not just in the ways dystopian sci-fi has portrayed. Whether it’s racist, inaccurate, or easily spoofed, getting computers to pick out faces correctly has been fraught with problems from the beginning. With more and more companies and governments using it, and having increasing impact on the public, the stakes are getting higher. Like many retro favourites, the Game Boy is in no way dead — development continues apace through its many fans.But what about the hardware side? This is a particularly interesting one: [Alex] wondered if a Game Boy could be readily used as a wireless controller. Set out to make it happen, the final product is a game cartridge that makes the classic handheld a wireless controller. It’s achieved quite elegantly, with a custom cartridge used to turn the Game Boy into a controller while requiring no modification to the handheld. 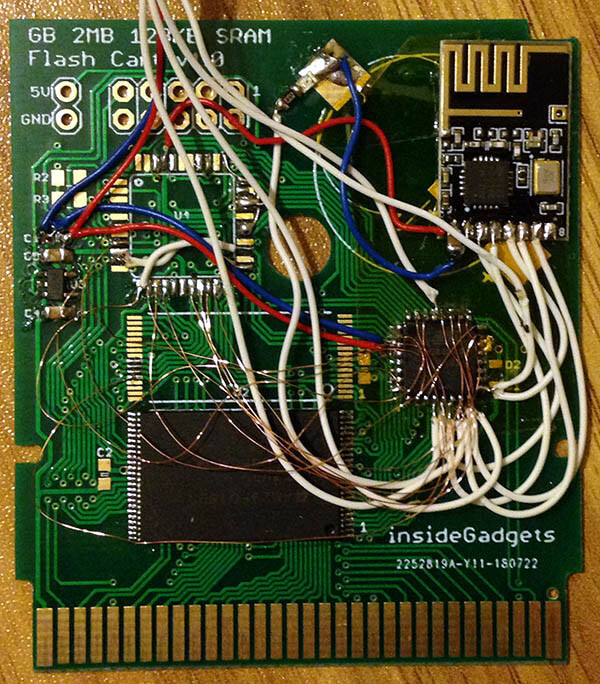 The cartridge contains a flash chip to store the ROM, along with an ATmega48PA microcontroller and an NRF24L01 to do the talking. Upon powerup, the Game Boy runs code from the ROM, and the microcontroller is in charge of reading button states and sending them to the NRF24L01 for transmission. The program stored on the ROM also allows configuration changes to be made from the Game Boy itself, such as choosing the appropriate wireless channel. The cartridge transmitter can be used with a variety of receivers. [Andy] has developed a USB HID joystick emulator to allow the Game Boy to be used with PCs, as well as a receiver for the GameCube, too. Yes, that’s right — you can now play Super Smash Bros. with a weirder controller than all your friends. A Super Nintendo version is also in the works. Perhaps the coolest feature, however, is that the cart can use its radio link to communicate with another Game Boy running the same cartridge. [Andy] demonstrates this with a basic game of Pong being played between two Game Boy Advances. Working on retro hardware can be great fun — things are well documented, parts are cheap, and there’ll be plenty of fans cheering you on, too. [Andy] has even made the hardware available for purchase on Tindie and his website if you’re not quite comfortable rolling your own. The Game Boy platform remains ripe for hacking – you can even take screenshots with a logic analyzer these days. Video after the break. People love their tech, and feel like something’s missing when it’s not there. This is the story of one person’s desire to have the venerable trackpoint in their new keyboard. [Klapse] loves a Lenovo old-style non-chicklet keyboard, so, despite the cost, five were ordered. They very quickly ended up with keys that didn’t work, although the trackpoints still did. After buying a sixth which ended up the same, [Klapse] decided that maybe giving up on the Lenovo keyboards was the best idea. A quick stop at a local store scored a fill-in mechanical keyboard, but in the back of [klapse]’s mind the need for a trackpoint remained. Maybe one could be frankensteined in to the keyboard that was just purchased? The keyboard’s circuit board had traces everywhere, with nowhere to drill through between the correct keys, typically between the G, H and Y keys. 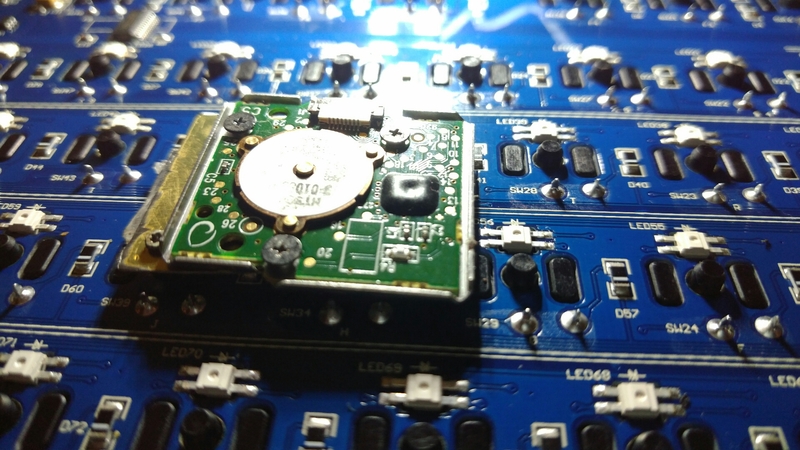 But there was a hole used for mounting the PCB nearby. between the H, J, U and Y keys. The trackpoint needed to be extended to reach all the way through the key caps, so [klapse] searched the house looking for something that might do. Turns out that a knitting needle fits perfectly. At this point a side-hack emerged. [Klapse] found a drill bit small enough to make the necessary hole in the trackpoint shaft to fit the needle. But the bit was too small for the drill chuck. In true hacking style, the bit was wrapped with duct tape and held in the drill. Sure, it wobbled a lot and it was really difficult to get it to drill in the center of the shaft, but it worked, eventually. The needle was cut off and glued into the hole, the key caps were modified a bit to allow the trackpoint through and the rubber tip put back on. They say, “desire to cram old tech into new is the mother of invention.” Or something similar, anyway. Check out how a Teensy liberated a Lenovo laptop keyboard trackpoint and all. Also, check out this custom keyboard with integrated trackpoint, of course.